back to life through nutrition and wellness. recommitted to achieve optimal results. 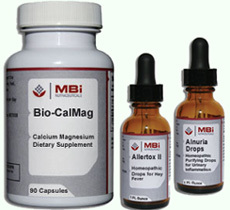 Molecular Biologics is now MBi Nutraceuticals. Additox Discontinued by the manufacturer. Relieve the symptoms of substance addiction. Allertox-I Discontinued by the manufacturer. Increase the body's tolerance for food allergies. Allertox-II Discontinued by the manufacturer. Increase the body's tolerance for inhaled allergens. Alnuria Discontinued by the manufacturer. Promote healthy kidney function and reduce urinary inflammation. Animal Antigens Discontinued by the manufacturer. Relieve stress through a healthy adrenal system. Balance and support the female reproductive system. Use the natural power of Cascara Sagrada and Senna instead of harsh chemical laxatives. Bio-Lax is an all herbal laxative designed to be as effective as an over-the-counter drug, but without the chemicals. Maintain a healthy lymphatic system. Bio-Mins is a complete mineral supplement in one tablet. Prevent deficiency and improve your general health by ensuring that you have adequate amounts of these key nutrients in the diet. Get it all in one product. BioNaturalvite is a complete vitamin and mineral supplement. Made with the highest quality raw materials, BioNaturalvite is formulated to provide maximum absorption and efficacy. This is the ultimate bone-strengthening tablet. Bio-Osteo has all of the vitamins and minerals you need, and in the right ratios, to ensure adequate bone nutrition and overall bone health. Bio-Pneumo Drops Discontinued by the manufacturer. Support healthy lungs and maximize oxygen intake. Bio-Renal Drops Discontinued by the manufacturer. Bio-Thymex Drops Discontinued by the manufacturer. Focused immune system support designed to maintain healthy thymus function. Bio-Thyroid Drops Discontinued by the manufacturer. Boost metabolism through complete thyroid support. Bio-Trimins - Discontinued by the manufacturer. Biodex 6X Discontinued by the manufacturer. Biodex 12X Discontinued by the manufacturer. Treat candida yeast infections with Biocandex drops. Biodex 30X Discontinued by the manufacturer. Biodex 60X Discontinued by the manufacturer. Biodex 100X Discontinued by the manufacturer. Biodex 500X Discontinued by the manufacturer. Biodex Combo Discontinued by the manufacturer. Counteract long term antibiotic use. Antibiotics can destroy the beneficial bacteria in the body, allowing pathogens to flourish. Biodophilus is used to treat urogenital and gastrointestinal infections. Biodophilus can restore the beneficial bacteria to the digestive system. Promote healthy function of the lower lungs. Promote healthier and stronger upper lung function and reduce the symptoms of bronchitis. Calendula Extract Out of Stock from the manufacturer. Cardaurum Drops - 1 oz Out of Stock from the manufacturer. Enhance memory and healthy brain function. Homeopathic Drops for Dairy allergies. Detoxify the body from heavy metals used in dental services. Reduce the level of toxicity of prescription drugs in the body. house mold, lint, mildew or paper dust. Homeopathic drops for fatigue and edema.